Quick overview "Chapter 6 A 2018 Robert Wilson"--T.p. verso. * New and updated content on developments in technology, risk management and event volunteering. * New and updated case studies that include emerging economies. * New industry voices by international practitioners. Every topic is brought to life through vivid case studies, personal biographies and examples of best practice from the real world of events management. 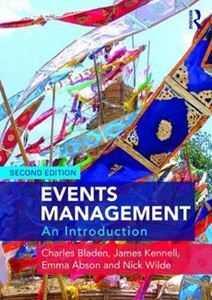 Written by a team of authors with many years' experience of working in the events industry, Events Management: An Introduction is the essential course text for any events management programme.